We all know about the conditions commercial chickens are raised in, and I can’t imagine a human anywhere that finds that acceptable, and yet we feel so confined by our food systems and by our lack of knowledge and experience. Example: me wanting to raise meat chickens but having never butchered anything (besides fish) before. A local family was kind enough to let us help them process their meat chickens and turkeys the weekend before Thanksgiving. We were able to go through the entire butchering process for eight chickens and two turkeys. There are a lot of steps and a lot of things to know. The Gentleman focused on the butchering and I on the scalding and plucking. It’s amazing how much you can learn when you are able to watch, do, ask questions, be given tips and tricks. 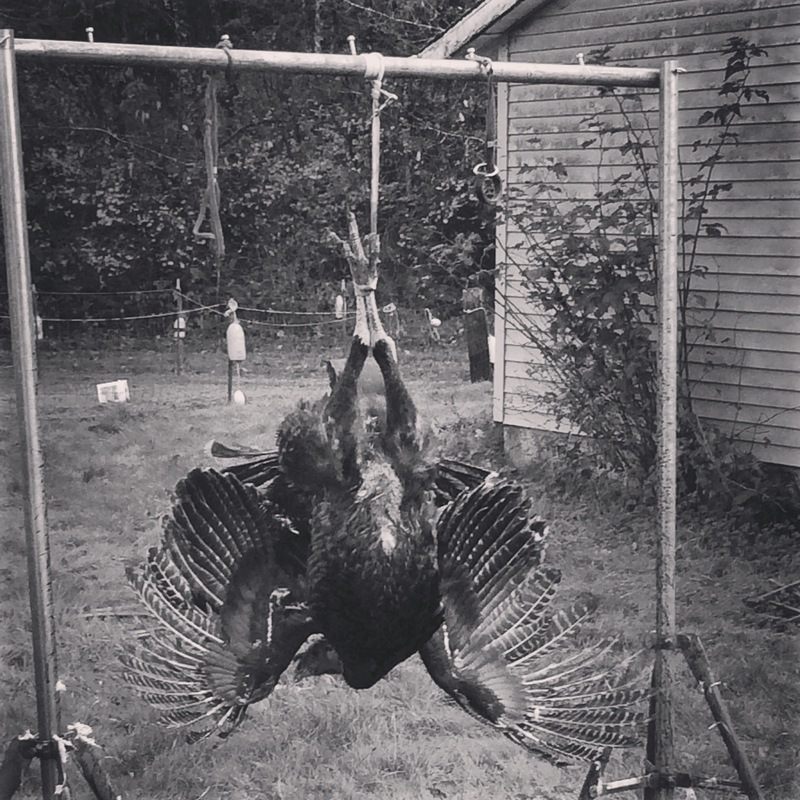 There was a moment while waiting to kill the first turkey, while she hung upside down, where I realized that this, this is the food system that we’ve cut ourselves out of, that we’ve lost so much knowledge about. This is our food. This bird was their thanksgiving dinner. How they raised, cared for, and now handled the dispatching and butchering of this turkey — the totality of these acts are the respect, grace, and love that they showed the bird and for each other from the moment they brought it home until they ate it. This is where our food comes from. We cannot begin (although we’ve tried) to thank these folks, who we now call friends, for letting us spend a crisp afternoon learning from them. They said someone had shown them once. They beyond graciously sent us home with two of the chickens. One we froze. The other bird we roasted and had a dinner, a couple of sandwiches, a big pot of stock, a pot of chicken noodle soup and a casserole for Thanksgiving day. (And yes, our hens, ate the scraps). We will raise meat chickens next year. Perhaps one day, we will be able to show someone else. 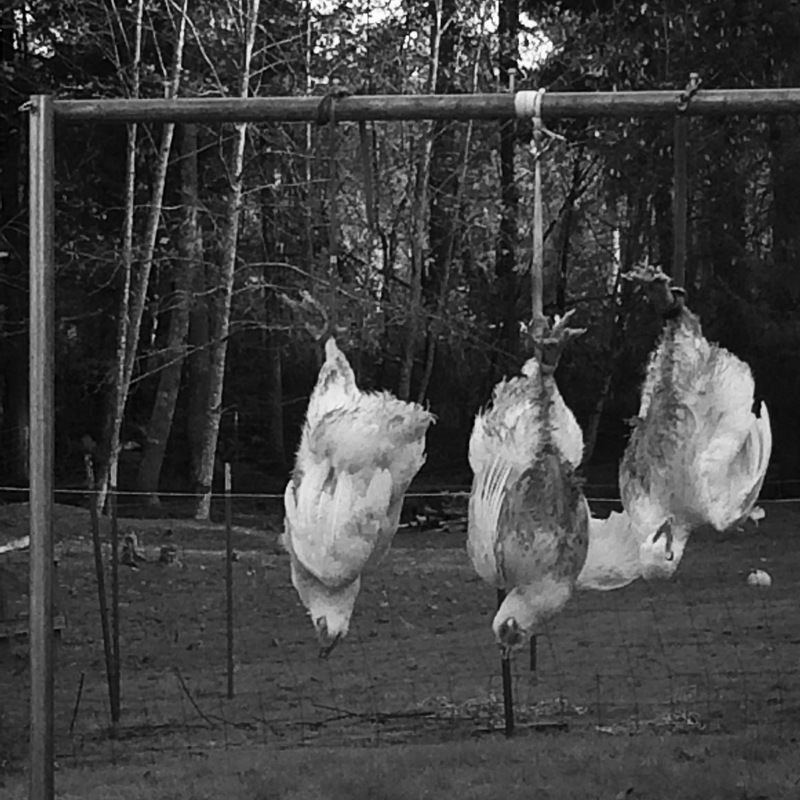 Below are two pictures I took — one of the chickens and one of the tom turkey — of the birds hanging prior to being killed, but I mention that in case there are people concerned about what might be shown. No blood, still live birds. 05 Dec	This entry was published on December 5, 2015 at 10:24 am. It’s filed under Critters, Family, Garden, Home, Projects and tagged backyard chickens, butchering, Chickens, community, food, food systems, Grace, gratitude, meat, production. Bookmark the permalink. Follow any comments here with the RSS feed for this post. I admire you for this, although I could not do it. I think it is the right thing to do. I eat very little meat when I am at home–I really don’t care much for the taste. But it is good to take responsibility for your actions. It’s not practical for most. I abhor the conditions under which most of our meat is raised. Everyone should read “The Omnivore’s Dilemma.” No more corn as food for animals that should not eat it! No more antibiotics in our food stream! Thank you for this post.